One Health Aotearoa prioritises career development for young researchers. Our engagement with international and global One Health networks fosters knowledge sharing, exposure and experience for New Zealand researchers and academics. We offer opportunities that can build management and leadership skills, development of systems-thinking, and the ability to work in a transdisciplinary environment. Operational research funding with stipend is available from the New Zealand Health Research Council for a PhD studentship based at the School of Veterinary Sciences, Massey University, Palmerston North, New Zealand. This is a unique opportunity to work with a globally important zoonotic disease in a high quality training environment with multidisciplinary supervisors and advisors. You will extend your skills in epidemiology, micro- and molecular biology, social science and data analysis. 5) establish a cohort of patients for long-term follow up. We will conduct a nationwide prospective case-control study with nested sub-studies to investigate source attribution, work-place attitudes and drivers of ACC acceptance. This study will take a multidisciplinary approach capitalising on our extensive network of national stakeholders in industry and public health across New Zealand. The ultimate goal is for this study to guide effective interventions to reducing the increasing burden of leptospirosis in New Zealand. We are looking for a scientist who is developing their independent thinking, is interested and informed about disease at the human-animal interface, wants to learn new skills or tools and can connect with patients, GPs, and medical officers of health. Patients are often rural based and in farming/meat working occupations. The successful candidate will have an Honour’s degree in a relevant discipline or a medical or veterinary qualification and a Master’s degree in a relevant field such as epidemiology, social science, microbiology, applied statistics etc. Informal enquiries and/or request for more detailed information can be made to Associate Professor Jackie Benschop (J.Benschop@massey.ac.nz). Applications (in the form of a cover letter outlining the candidate’s motivation, together with a CV) should be emailed to Ms Wendy Maharey (W.Maharey@massey.ac.nz). The closing date is 6 July 2018. Ali is exploring a breath test for Legionnaires’ disease. Ali is undertaking his PhD with The Infection Group. He is supervised by Professor Steve Chambers, David Murdoch and Dr Amy Scott-Thomas. Professors Murdoch and Chambers are regarded as global experts in infectious disease, including having particular expertise in Legionnaires’ disease. Legionnaires’ disease is a type of pneumonia, often diagnosed in the elderly, very young and people with weak immune systems. The most common test involves collection of sputum samples which can be difficult. Ali’s project is developing a simple test for Legionnaires’ disease which could save the elderly and children unnecessary stress and pain. He is working on a breath test to diagnose the disease. Ali is taking breath samples from pneumonia patients, as well as growing the legionella bacteria in the laboratory with other cells to find out if there are particular metabolites given off by Legionnaires’ disease. Identifying metabolites specific to Legionnaires’ disease will allow the development of a test which could ultimately speed up diagnosis and mean far less pain and aggravation for patients. Ali explains that every living organism, including bacteria, produces metabolites. These chemicals or gases are the end product of the organism’s metabolism and some can be unique to a particular organism. Cattle are the main reservoir of the STEC pathogen. Andrew’s doctoral thesis is ‘A food chain approach to control of shigatoxigenic E. coli in New Zealand’. 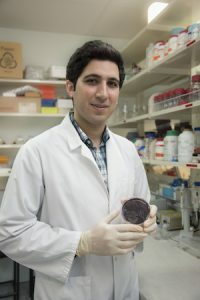 His research focuses on improving the methods of detection for seven of the most common shigatoxigenic E. coli (STEC), as well as understanding the risk factors and overall prevalence of STECs in New Zealand. 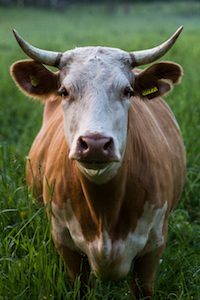 STECs can cause serious and sometimes fatal disease in humans, and cattle are recognized as the main reservoir of the pathogen. The research is part of a collaborative effort with the Ministry of Primary Industries (MPI) and the meat industry, to protect public health and New Zealand’s meat export trade. Andrew grew up in Southern California, and raising exotic bantam chickens as a kid established my desire to become a veterinarian; “I have a strong interest in wildlife and exotic medicine, emerging infectious disease, and veterinary public health”. Leah is a PhD candidate investigating multidrug resistant enterobacterial infections in New Zealand. She is particularly looking at family pets as a risk factor. New Zealanders have a strong affection for household pets, studies show that 68% of households own at least one animal companion. But these animals are also a possible source of multi-drug-resistant bacterial infections, which the World Health Organization has identified as a major threat to human health, with numbers of infections on the rise. 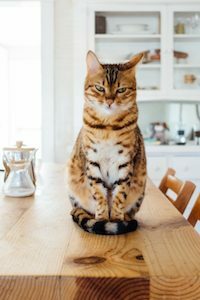 The study, which Leah is assisting with, looks at how households interact with their pets, and how antibiotic use and lifestyle factors may contribute to the spread of drug-resistant bacteria between animals and humans. Researchers will carry out an assessment of the molecular epidemiology, virulence profile, transmissibility, population structure and phylodynamics of ESBL/PMACBL-E isolated from humans and household pets.